Back in the day, Ozzy Osbourne was known for tossing pig intestines and cow livers into the crowds at Black Sabbath concerts. According to legend (and video footage), he actually bit the head off a live bat at one point. And... now he's a vegan. Amazingly, I have something in common with Ozzy Osbourne (other than distressingly unruly hair). Contact Music announced Ozzy's new vegan diet last week, and Ozzy recently talked about his choice to go vegan with fellow vegan Sara Gilbert on his wife Sharon's show The Talk. When asked what inspired him to make the switch, he answered, "My assistant showed me a video called Forks and Knives (sic) or something, about (cutting out) meat and dairy products, so I thought, 'I’ll give this a shot!'" Despite his confusion of the name of the film Forks Over Knives - Sharon later refers to it as "Forky Knife" - Ozzy seems to be secure in his dietary decision. The audience members laugh at him when he says he's only lasted a week so far as a vegan. But he takes the high road and explains how much better he feels now that he's changed his diet and is working out every morning. 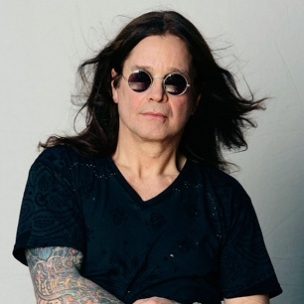 I'm excited to see the ranks of celebrity vegans growing (Katy Perry and Russell Brand, Bill Clinton, Ellen Degeneres and Portia DeRossi, to name a few), even if Ozzy does admit he's not sure how long his veganism will last. It demonstrates that vegans aren't all weird, blog-writing, socially awkward hippies and hipsters. Some of us are. But not all. And hey, if the Prince of Darkness can pull of veganism, anyone can!